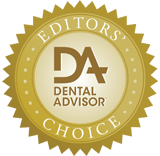 Use a dentin/opaque shade in areas of class III and IV restorations to prevent shine through. Use a layering technique to optimize opacity and translucency. For the last increment, use a microbrush with a little bonding agent on it and gently move the microbrush from the composite to the cavosurface margin for a seamless restoration. Use long bevel margins for finishing at cavosurface margins. Wax-like consistency when handling it – once you get used to the way it handles, it is great. 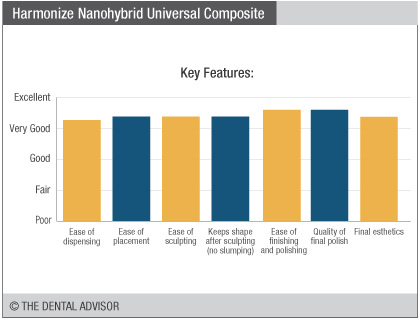 Harmonize Nanohybrid Universal Composite was evaluated by 33 consultants for a total of 829 times. Easy to use and dispense. Packable and easy to sculpt with no slumping afterwards. Available in dentin, enamel, bleach, translucent, and transparent shades. Adaptive Response Technology (ART) enables dynamic viscosity for superior handling and optical characteristics that mimic human enamel. 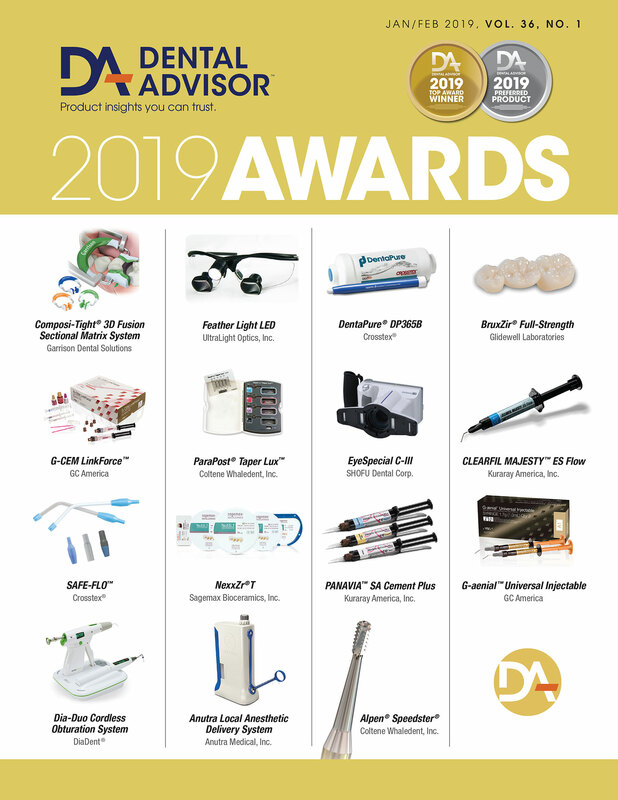 Excels in all three categories: strength, handling, and esthetics. Fast polishing time, great natural luster. Harmonize™ Nanohybrid Universal Composite is a light-cured, esthetic nanohybrid resin composite. The filler load is 81% and the filler particles result in refraction and diffusion of light such that this composite offers a chameleon effect to blend with tooth structure. This composite can be placed, packed and sculpted immediately. It is non-sticky and soft during sculpting – the viscosity then increases to prevent slumping. Light curing should be performed with a minimum light output (LED or halogen) of at least 600 mW/cm2 in the 400-520 nm range. 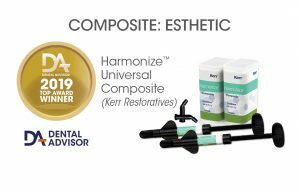 Harmonize Nanohybrid Universal Composite is available in a wide range of enamel, dentin and translucent shades. Each shade can be used individually or blended with other shades for a natural-looking restoration. The composite is delivered in single 4-gram syringes and uni-dose capsules in packs of 10 (2.5 grams) and 20 (5 grams).